In the present study, the finger millet grains were subjected to γ-irradiation at four different dosage levels: 2, 5, 10, and 15 kGy. Effect of γ-irradiation on the proximate composition, pasting properties, lipoxygenase activity, and antioxidant properties of finger millet flour was evaluated. Moisture, protein, fat, ash, and carbohydrate content of native flour was 12.96, 6.85, 2.73, 1.57, and 73.69 g/100 g, respectively. According to the results of proximate analysis, γ-irradiation significantly (p < 0.05) reduced the moisture contents and increased protein contents; however, the fat content of the irradiated flour was equal to or lower than that of the native flour. Pasting properties of the finger millet flour was reduced with the γ-irradiation. Compared with the native flour, lipoxygenase activity and malondialdehyde content decreased and radical scavenging activity, catalase, and superoxide dismutase activities increased in the irradiated flour with increasing γ-irradiation doses. Finally, the present study suggested that the γ-irradiation process improved the antioxidant enzymes and physicochemical characteristics; which could be helpful in formulating tailored made food products. 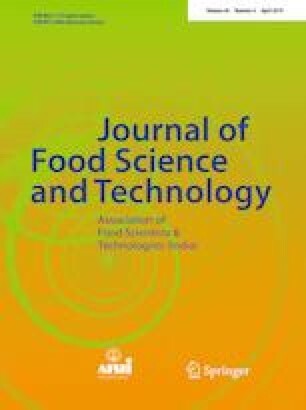 The authors are grateful to the Department of Food Science and Technology, Centre of Bioinformatics, and Central Instrumentation Facility, Pondicherry University, Puducherry for providing laboratory and instrumental facilities. Authors claim that there is no conflict of interest.